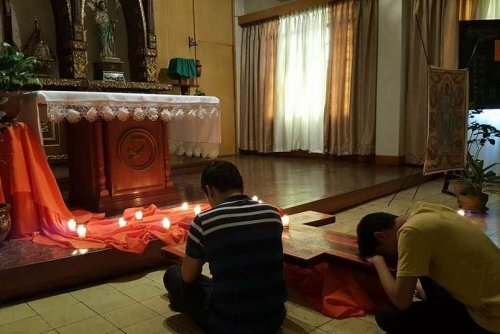 Last September 2016, a group of young people who have spent 3 months in Taize in the last years, gathered at the CBCP Chapel, Intramuros, Manila for a day of reflection and silence, sharing in groups, and prayer. The event was organized by the CBCP-Episcopal Commission on Youth and the Taizé Community, which have been collaborating since the 1980’s. Fruits of this collaboration were the two Pilgrimages of trust on earth in 1991 and 2010, where thousands of young people from Asia and the rest of the world came together in the spirit of faith and solidarity. The community supports the continuing of this pilgrimage through their annual visits, where they animate faith sessions, facilitate retreats and recollections, or simply join a community in prayer. The participants read and reflected together on the letter of Br. Alois entitled “The Courage of Mercy”. After their personal reflection, the participants grouped themselves by choosing the proposal which struck them the most. The participants shared with one another their experiences of God’s mercy, and the challenges for them to practice this Christian virtue. Then, after the group sharing, they presented creatively the fruit of their sharing in the big group. The participants then committed themselves to live a prayerful life, living the courage of mercy in their present realities, situations in their community and in the Church. As former permanents at Taizé, the participants felt called to renew their commitment towards deeper rootedness in the faith, which would enable them to become persons of solidarity and communion for others. In the same period, Brothers also visited Zamboanga, Basilan, various places in the Visayas, dioceses closer to Manila : Imus, Malolos, Antipolo, Paranaque but also Northern Luzon in Bangued (Abra). The Episcopal Commission invited them to the National Youth Day at Kalibo. In December 2016, a staff-member of the ECY accompanied one brother to Sri Lanka, to help animate a daily prayer during the FABC Plenary Assembly in Negombo. Through Br. Alois’ letter, “The Courage of Mercy”, the participants obtained renewed inspiration to live a life that is more rooted in prayer and strongly committed to respond to present-day situations in the light of God’s mercy. This beautiful message was shared and promoted by the former permanents in their own communities in various ways. One was through a Prayer-Workshop facilitated last October with 50 youth leaders from the parishes and various youth groups in the Diocese of Tarlac. Another activity was the Prayer for Peace that took place in San Antonio Abad Parish in the Diocese of Pasig last October 28, where a youth minister shared to the participants her experience of the Lord’s mercy during her stay as a permanent in Taizé from July to September 2016. Also, the letter from Taizé was shared through a day of prayer and reflection with the theme “Celebrating the Vincentian Charism in the Year of Mercy”, with some 70 students from the Adamson University last October. 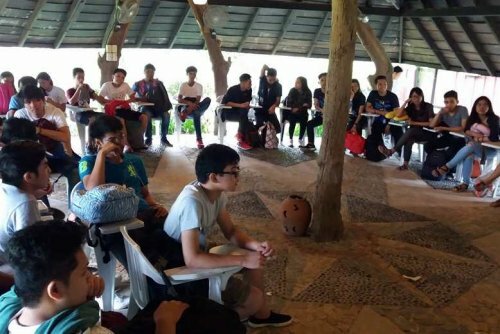 Furthermore, the same message was also used as a guide for reflection during the recollection of volunteers preparing for the National Conference of Youth Ministers in the Diocese of Dipolog last October 15. The theme of that conference focused on the call for youth ministers to become truly radical in living God’s mercy. The recollection helped the volunteers imbibe the proper attitude and disposition for being channels of God’s goodness as they served the participants who attended the conference. The letter from Taizé was also shared as a guide for reflection in a session with a group of college students during the Diocesan Youth Day in Tarlac last November. A Festival of Mercy was also held in Adamson University last November, gathering the students to celebrate God’s merciful love. Thus, the call to live the courage of mercy has been echoed through various initiatives. By God’s grace, these little efforts are multiplying and becoming fruitful as the message reaches more young people; touching their hearts to choose the path of mercy. During the pilgrimage of trust in Manila in 2010, Union Church of Manila was one of the places of welcome. A regular prayer started during the preparation and continues today. One of the main organizers wrote: “We had our last Taizé prayer for this year in September in the middle of a busy season, things didn’t play out as planned and as always there are always challenges, but in the end, it is the work of God. I was able to pray while I was praying. It has become a little joke between us – this challenge of being in the present moment”. Then, sharing about the situation in the country, she wrote: “What is in store for us no one can tell. How do we stem the tide? How do we stand the ground of truth and hold on, awaiting the light? And so in the silent night hours I sing “Our darkness is never darkness in Your sight, the deepest night is clear as the daylight”. Light and shadows, much like the days of our lives.